In Part I I described to how integrated LiquidFun with Cocos2d-x. In this part (part II) I’ll describe how to render the particles using a basic water effect. LiquidFun + Cocos2d-X using Render-To-Texture technique to simulate water. 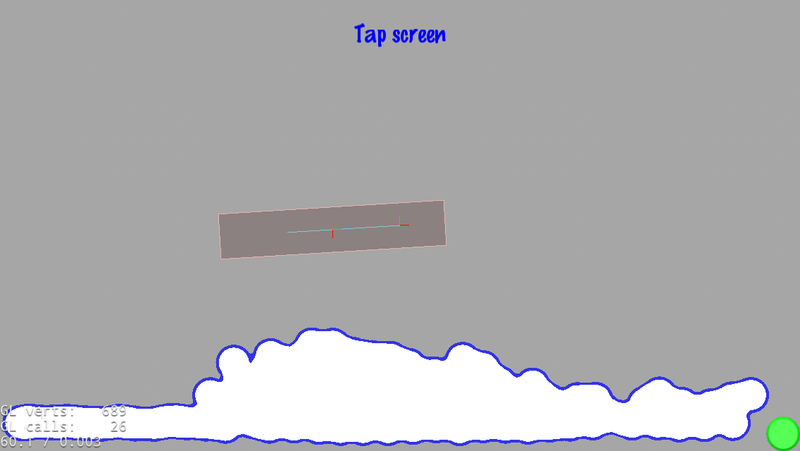 Part I uses just one glDrawArrays(GL_POINTS, 0, total); to draw the particles. And although that works to draw “particles”, it is not enough to draw “water”. Drawing “water” requires a more complex rendering algorithm, like the one used in this example. And implementing an algorithm similar that one is what this article describes. Choose a white circle and blur it. Or you can blur it off-line. The values u_threshold_discard, and u_threshold_border are defined at runtime. In the example, they are set at 0.15 and 0.3 respectively. The next thing to do is, to render the particles in the RenderTexture. As an example, the official “LiquidFun – EyeCandy” sample from Google uses a much more complex shader that involves lighting, refraction, and distortion in the background. The next thing to do is to add custom uniforms and/or attributes using the GLProgramState API. Clone the cocos2d-x-samples repo and follow its instructions. Then launch the “LiquidFun – EyeCandy” demo. my environment is win7.Load your project.It can run,but render out without water. Thanks. I’ll take a look at it later. I got same situation. I use cocos2dx 3.3version. HI Ricardo. Thanks for the followup tutorial and instructions to build the project. But as Cocos2d-x is not updated to 3.2 and Mat4 is kmMat4 now (I think) and a lot has changed. Could you kindly show how to make it work on 3.2? Pls. Thanks. Hmm.. i just checked the version sry. It is 3.2. But when I created my own project in 3.2 and added the liquidfun box2d folder and added your classes and resources I got a whole slew of errors. What errors do you get ? Found the problem. The cocos_console_root is still pointing to my v3.0 project so even if I goto 3.2 and create a new project it doesnt copy the 3.2 version of cocos2d but 3.0. Regarding Mat4, it is the other way around in 3.0 kmMat4 is used and not just Mat4. can not find box2d stuff, although i have add box2d file from liquid. I very excited with this tutorial. I’m developing a project using water effect like this and it helps me a lot. Thanks you so much! But, I want my water is like the game Where’s my water. I mean, the water particle is look like water shape, not just a circle. I think I have to use shader but I don’t enough experience. Can you help me? Thanks so much. probably you will need to play a bit with the shader. In order to make it look more like a water, you can still use circles. Probably you need to use smaller “solid” circles, and a bigger “gradient” area. Using a different shader will also help. Please, take a look at the source code of the LiquidFun Demo (it is on the android store). It uses a much more advanced shader and it looks like real liquid.